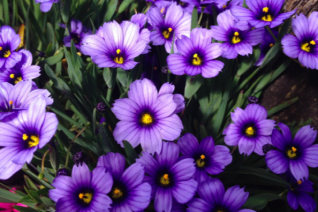 Sweet little blue eyed grass with a penchant for being different. 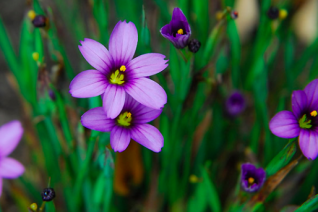 Eschewing the purple and yellow and blue flowers commonly assigned to this genus this little freak puts out simple flowers with petals that alternate soft tan and purple. Its a groovy combination and adds a wild flower flare on long thin stalks to 18″ tall. Forms increasing clumps of grassy blue/green foliage. Deciduous in winter. Full sun and rich to average well drained soil with light but consistent summer water when established. A good sized clump can measure about 10″ across after several years. 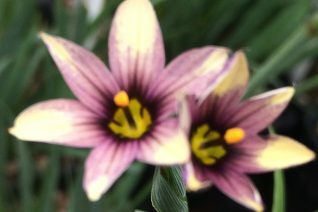 A charming perennial that we have found is excellently adapted to the open mindedness of the west coast as well as climate. Easy. Gay Iris relatives are few and far between. Treasure them. Moderate deer resistance.